Plants can be classified on the basis of their height, stem and branches. On these parameters, plants can be of three types, viz. herbs, shrubs and trees. Shrubs: These are bushy and medium- sized plants and they are somewhat bigger than herbs. Their branches start from just above the ground. Examples: Lemon, Coriander, Henna, Rose, etc. Creepers: Plants with weak stem that cannot stand upright and spread on the ground are called creepers. Examples: Pumpkin, Watermelon, sweet potato, etc. Climber: Plants with weak stem that needs support is called climber. Examples: Grapevine, money-plant, cucumber, bean, etc. A typical plant contains two main parts, viz. roots and stem. The stem bears leaves, flowers and fruits. Root: The underground part of a plant is called root. It is usually pale in colour. Tap root: This is composed of a main root which grows from the base of the stem. Many branches and sub-branches come out of the main root (tap root). Examples: pea, radish, carrot, mango, marigold, mustard etc. Fibrous root: In this type, a cluster of thin fibre-like roots arise from the base of the stem. These roots spread out in the soil. Examples: Maize, grass, wheat, millet, etc. 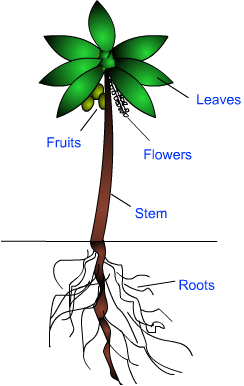 Stem: Stem usually grows above the ground. The stem makes the main structural framework of the plant. The stem bears leaves, branches, buds, flowers and fruits. The point from where branches or leaves grow is called node. The portion of a stem between two consecutive nodes is called the internode. The leaf is a thin, flat and green structure which arises from the node of the stem. The green colour of leaves is due to the presence of chlorophyll. Chlorophyll is a green-coloured pigment. The flat green portion of the leaf is called leaf-blade or lamina. The leaf is attached to the stem by a short stalk; called petiole. Stomata: There are many small openings on the lower surface of a leaf. These are called stomata. Stomata allow gases to enter or exit the leaf. Unwanted water is also removed through stomata; in the form of water vapour. 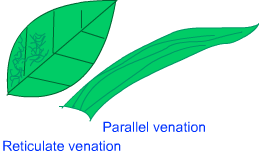 Transpiration: Loss of water vapour from plants through stomata and lenticels is called transpiration. A major portion of transpiration happens through stomata. Photosynthesis: This is the main function of a leaf. Plants prepare food from carbon dioxide and water; in the presence of chlorophyll and sunlight. This process is called Photosynthesis. Flower: Flower is the most beautiful and colourful part of a flowering plant. It is the reproductive part of a plant. Sepal: The outer green leafy structure in a flower is called sepal. Petals make the first whorl of a flower. This whorl is called calyx. It protects the flower at bud stage. Petals: The coloured leaf-like structures; next to the sepals; are called petals. The bright colours of the petals, attracts insects. This helps the plants in reproduction. The whorl formed by the petals is called corolla. Stamens: Around the centre of the flower there are many little stalks with swollen tops. These are called Stamen. It is the male part of the flower. Each stamen consists of a green stalk called filament. A capsule-like structure; called anther is at the top of the stamen. The anther produces pollen grains. Pollen grains are powder like particles and take part in reproduction. Pistil: It is the female part of the flower. It is a flask- shaped structure in the middle of the flower. It is divided into three parts. Ovary: The lower broader portion of the pistil is called ovary. It contains the ovules which take part in reproduction. Style: The narrow middle portion of the pistil is called style. Stigma: The sticky end at the top of the style is called stigma.